Windows 10 has come up with lots and lots of new features and it has retained some old features from it’s earlier versions as well. One of those old features include our own old Windows clock, right at the lower right corner of our Windows screen. 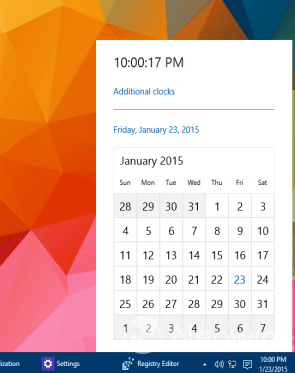 Of couse, some users find it super handy as the clock quickly tells us what day and time it is. But is that applicable to everyone? Definitely not! Some users want their desktop to look as clean as a whistle. Definitely for such users, an imposed clock do possess a problem to deal with. Some other users prefer to use some third party app to check the date and time. So, indeed, being in control of what’s being displayed on your Windows screen matters a lot. Don’t worry though, Windows definitely has a solution to everything. You just have to find it. 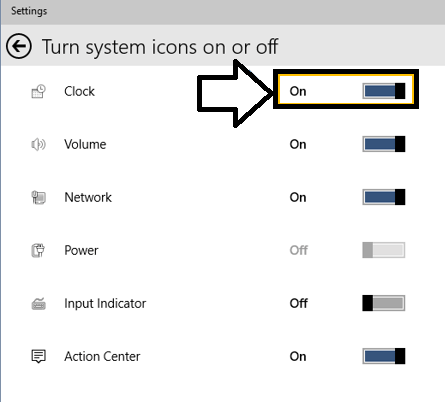 Read on, to learn how to remove the clock icon from your Windows Taskbar, and to restore it later. The procedure is somewhat the same for all the Windows versions. If you have used Windows 7 at some point in your life, you are definitely going to find the steps quite easy to understand and perform, as it’s nearly the same for both the versions. First of all, hover your mouse over to the lower right hand corner of your windows screen. There you will find the clock icon. Right click on the clock icon. On right clicking the clock icon, a small window will pop up. Choose Customize notification icons from it. You will see a list of items you can choose from. We are looking, however, for customize Notifications and actions. Under the Notifications and actions panel, find Turn system icons on or off. On clicking it, you will be lead to another window where you will get to make the desired action. You will see an entry for the clock icon. It will be on by default. 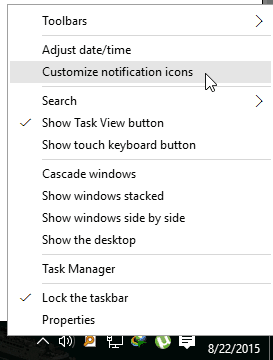 You have to turn it off, to take the clock icon off your Taskbar. Just flip the switch off in the clock entry. The change is immediate. No need to save, no need to reboot. You can see the clock gone in your Taskbar. It’s as simple as that. Restoring the clock icon back in it’s old position is not at all hard. You can just navigate to the Settings page from the Start menu. Once you are on the settings page, you can just find the Notifications and actions tab just as before. From it, click on Turn system icons on or off. Now flip the switch from off to on in the clock entry to get your old clock back in it’s position, all smiling and happy.